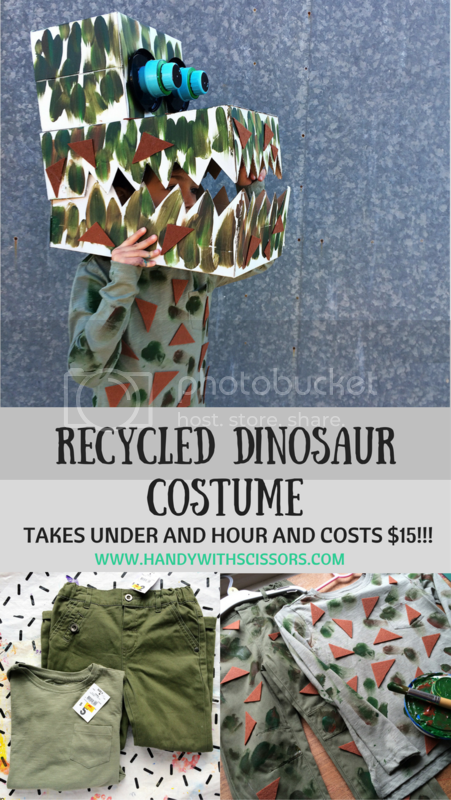 The best thing about this costume is that is costs under $15 and takes under an hour to make. WINNER! Now, I should mention here that I realised after I had proudly taken the first batch of photos that I had forgotten to make a tail #rookiemistake. Luckily we had one in our costume box so I added this to our costume before the big day along with a few small adjustments to the costume to make it blend in. As a result this tutorial doesn't include a tail but you could either leave it out and hope no one notices, or buy or make one pretty cheaply. NOTE: Pictures 1-4 are not from the final Dino costume we made. As usual, I was too impatient to take pictures as I was making ours, so this is just a smaller scale model to show you what we did. 2. Cut a hole in the base of the box, big enough to fit your child's head through. 3. Make some small holes in your box pieces where I have placed the red stickers on the picture. Don't make the holes too big as you want the screws to be a nice tight fit. Put the pieces on top of each other being careful to line up the holes. You may need to adjust your holes a bit if they don't line up. Insert a small screw in each of the holes then reinforce with hot glue. 4. Glue a smaller box on top to finish your head. 6. To make an even base to paint on spray paint your dino head white. 7. Ask your studio assitant to help you paint green and brown. 8. Make some eyes by gluing together some big lids. You can paint these or just leave them as it. You could also make these out of cardboard or just paint directly onto the box. Glue these onto your dino head once it is dry. 1. Go out and buy the cheapest green or brown clothes you can find or even better, find some old clothes at home that you are not wearing any more. We managed to find a tshirt and pants for $9 from Kmart. 2. Cut out some brown felt shapes and glue them all over your top and pants. Next, mix up some brown and green paint and apply this in blotches around your triangles. Congratulations! You just make a dinosaur!!! But wait I hear you say, where is the tail?? Well, to be perfectly honest we forgot to make one but luckily we had one in our dress up box. To make the tail look like part of the costume we added in some yellow triangles to the overall design.